Has someone on your list been very (very, very, very) good this year? 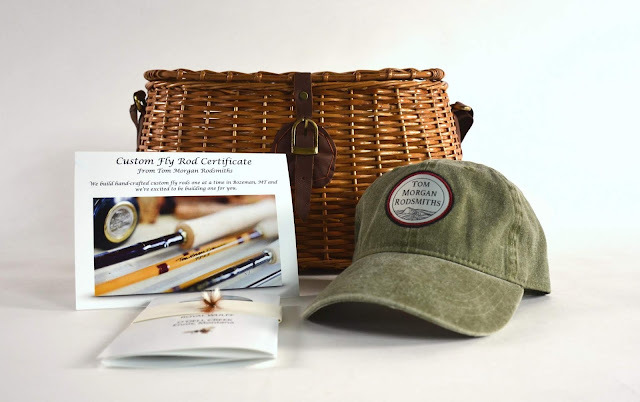 If so, maybe consider gifting them a Tom Morgan Rodsmiths Custom Rod Certificate that comes complete packaged in a wicker creel basketthat also includes TMR cap, sticker, Tom's story of the "Royal Wulff" and of course the certificate. Like I said, have they been really good? Even before Tom Morgan's passing, the team at Tom Morgan Rodsmiths was changing with new ownership but with the commitment to do all things with unwavering excellence, as they had been done for decades before. The website may have been refreshed but Tom's words can still be found throughout the pages and are certainly worth a read. Tom's philosophy on fiberglass fly rods is a great place to start. Visit the website for the details on a Tom Morgan Rodsmiths Custom Rod Certificate.